This post is a continuation of the Monday Munchies series where I show everything I eat over the course of single day – in this case, a Saturday three weeks ago (no, I’m not kidding). I thought about scrapping this day; however, as you’ll see, this day shows, once again, that there’s no such thing as “perfect” eating. Dietitians everywhere enjoy a “wide” variety of foods. * and I became a student once more. That’s Life with a capital “L”. How does one begin after five months without a single Monday Munchy? Never fear, Bircher muesli fans! I would never give up my favorite easy breakfast. 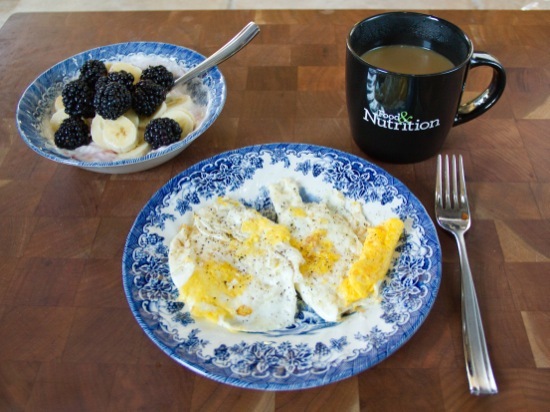 Lately, I’ve been on an eggs-and-fruit kick that won’t quit. 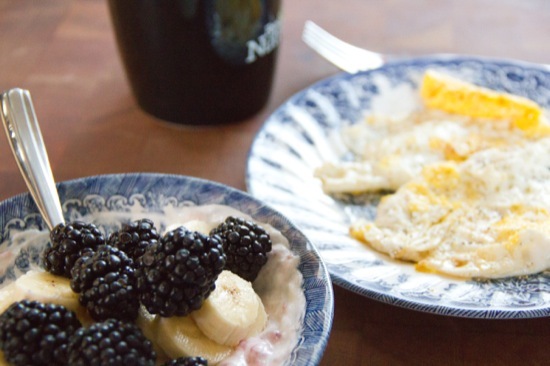 Here, we have a couple of over-hard eggs and a bowl of Greek yogurt with a tiny banana and blackberries. Served with hot Yorkshire Gold and nonfat milk. One benefit of reflecting on a three-week-old meal (a phrase that sounds terrible when taken out of context) is the emotional distance that comes with the knowledge that the meal is long gone. Perhaps we would do well to remember that every meal and snack is an opportunity to nourish the body rather than regret less-than-satisfactory food choices. Also, those blackberries still look delicious. 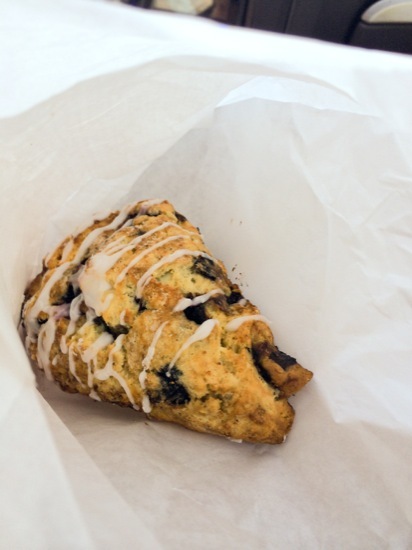 That would be a lovely blueberry scone, captured in a wan light of an inferior phone picture. I enjoyed half and lost track of the other half (maybe Maddie got it). Speaking of less-than-satisfactory food choices. 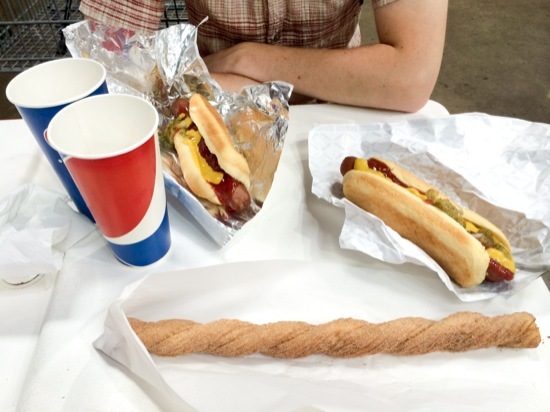 Your eyes do not deceive you: That is two giant hot dogs and a churro that appears to be about two feet long. Let me explain. Whenever we’ve gone into a Costco, Peter laments the long line for Costco hot dogs (should those words really go together?). By chance, we struck upon the equivalent of weekend gold (at least, according to Peter): a short line and a ready availability of long hot dogs. Of course, he couldn’t pass it up. I looked at food pictures worked on my phone while Peter waited in the two-person line. As a dietitian does, I expected him to come back with a single hot dog we could both try. Instead, he returned with everything in the picture above. (2) This was good practice in listening to my body. Despite the small food volume, I didn’t want anything for the rest of the day. No need to follow a strict food schedule just for the sake of a schedule. 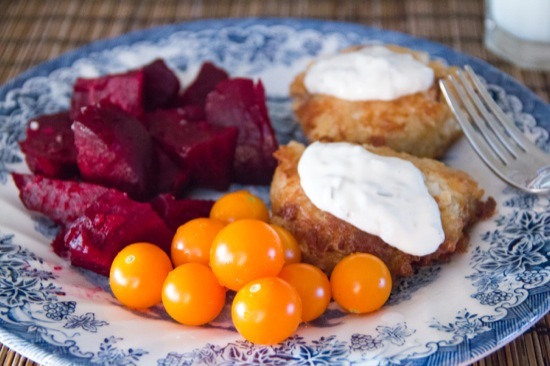 Peter-made crab cakes with tomatoes and fresh roasted beets. 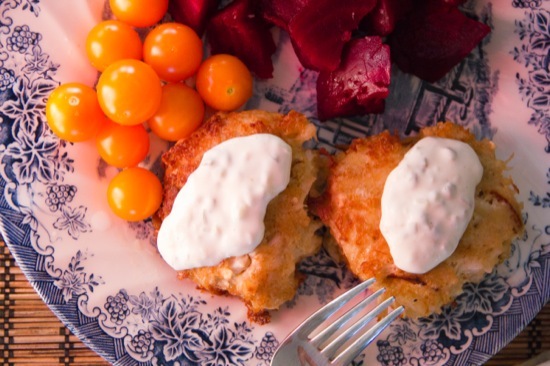 The crabcakes were topped with Peter’s homemade tartar sauce. I suppose with a home-cooked meal this good, I can forgive Peter’s earlier meal of beige. Not too shabby, dear reader, not too shabby. I love that your Monday Munchies reflect intuitive eating! Cosco is so dangerous for me though- even if I’m not hungry I want to try all.of.the.samples. That bowl is making my crave blackberries! I always love your Monday Munchies posts! I also still love Bircher muesli (thanks to you!). Dinner looks and sounds wonderful! Does it have vinegar in it? Hi Rayman! Does what have vinegar in it? Lol. 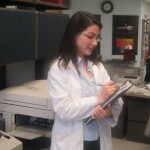 That was just the running joke with your samples at Strawberry Fields right? As always delicious looking stuff!I’d like to try those crab cakes! Hope you’re liking Oregon! Shoot me an email sometime at ds0560@gmail.com. Take care. Haha, that’s right! More vinegar for you!! 😉 Hope all is well in IL! I love seeing pictures of home-cooked munchies especially outside of home, always curious to see what everyone eats during the day and darn, these fresh roasted beets are pretty tasty! Have you tried Veggie Grill’s crab cakes? They are hands down yummy! My dad grew up eating seafood and crabs and couldn’t tell they were vegan!